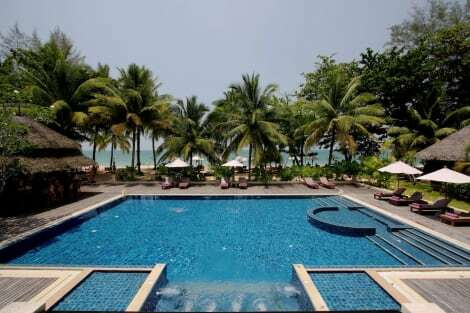 When you stay at Sensimar Khaolak Beachfront Resort in Takua Pa, you'll be on the beach, a 1-minute drive from Nang Thong Beach and 9 minutes from Khao Lak Beach. This 4-star resort is 3 mi (4.8 km) from Bang Niang Beach and 2.3 mi (3.7 km) from Tsunami Memorial Museum. Featured amenities include limo/town car service, express check-in, and express check-out. Planning an event in Takua Pa? This hotel has facilities measuring 2249 square feet (209 square meters), including a meeting room. A roundtrip airport shuttle is provided for a surcharge (available 24 hours), and free self parking is available onsite. Enjoy international cuisine at Touch Beach, a beachfront restaurant, or stay in and take advantage of the room service (during limited hours). Relax with your favorite drink at the beach bar or the poolside bar. Buffet breakfasts are available daily from 7 AM to 10:30 AM for a fee. Enjoy international cuisine at Tropical Garden, one of the resort's 2 restaurants, or stay in and take advantage of the room service (during limited hours). Relax with a refreshing drink from the poolside bar or one of the 2 bars/lounges. Buffet breakfasts are available for a fee.